The situation in the curfew-bound areas of Jammu and Kashmir remained tense on Friday after a Bharatiya Janata Party leader was shot dead by suspected militants in Kishtwar, as the army staged a flag march in certain places and the state government constituted a Special Investigation Team to probe the incident, officials said. The communally-sensitive Kishtwar area, about 240 km from Jammu, saw the army patrolling the streets and warning people to remain indoors in view of the restrictions imposed by the state administration after the killings of BJP leader Anil Parihar, 52, and his brother, Ajeet Parihar, 55, on Thursday night. Two personal security officers -- Om Prakash and Sahil Kumar -- of the BJP state secretary, have been detained for questioning. "The SIT has been constituted by police to probe the killings. It is headed by Assistant Superintendent of Police Prabeet Singh," deputy commissioner Kishtwar Angrez Singh Rana said. Police has started picking up evidences and recovered an empty shell of AK rifle from Tapal Mohalla, where the duo were killed by suspected militants while they were returning home after closing their stationary shop located outside old DC office complex. A senior police official said that the incident needs to be probed in detail as militancy had been completely wiped out from this region in 2009-10. The bodies of Parihar brothers were consigned to flames in the afternoon. Union minister Jitendra Singh was present along with around 4,000 people amidst heavy rains which lashed parts of the Jammu region. 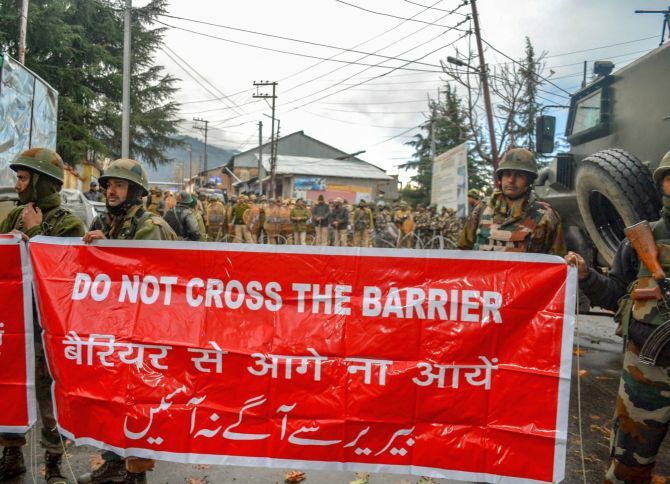 The army also staged a flag march in twin towns of Doda and Bhaderwah in the day. Three senior superintendents of police Sandeep Wazir, Manohar Singh and Faisal Qureshi have been deputed to Kishtwar for special duty to ensure law and order. Inspector general of police Jammu S D Singh and deputy inspector general Doda-Kishtwar-Ramban is also camping in Kishtwar town to monitor the situation. SSP Kishtwar Rajinder Gupta said a hunt was launched to track down those involved in the case. 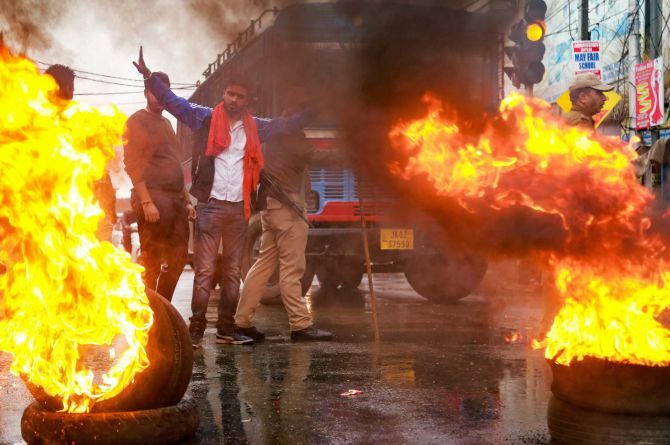 The Bharatiya Janata Party and the Vishva Hindu Parishad blamed police and security agencies for their "failure" to act on the inputs about the increasing underground activities of terrorists resulting in the killing of the senior BJP leader and his brother by suspected militants. "The police and security agencies have failed to take steps to prevent these killings. A terrorist module was busted recently, but nothing has been done to foil the designs of terrorists in this district," former BJP minister and MLA of Kishtwar Sunil Sharma told reporters. The VHP said that it appears militancy is fast returning to erstwhile Doda district due to failure of police. "The killings is a pointer to failure of security and intelligence. It appears that militancy is fast returning to this belt due to failure of security grid," state VHP president Leela Karan Sharma said. In order to facilitate students for board exams, the administration has directed police to consider their roll number slips as curfew passes. "As of now, the situation is completely under control with no untoward incident reported from anywhere, but as a precautionary measure both mobile and broadband internet services have been suspended and the army also took out a flag march in the afternoon," the official said. Amid shutdown in some places, massive protests rocked Jammu division Friday against the killings. 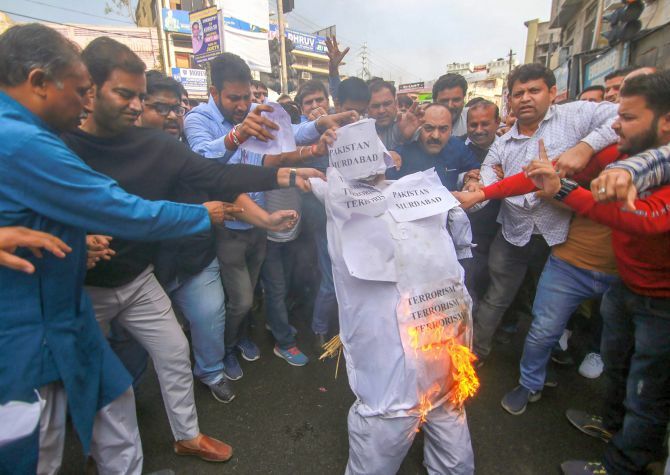 People had staged angry protests in the communally-sensitive town and manhandled senior police officials following the incident. District Magistrate Kishtwar Angrez Singh Rana sadi that the situation was tense, but under control. "The army staged a flag march in Kishtwar town in order to maintain law and order this morning," Rana said. 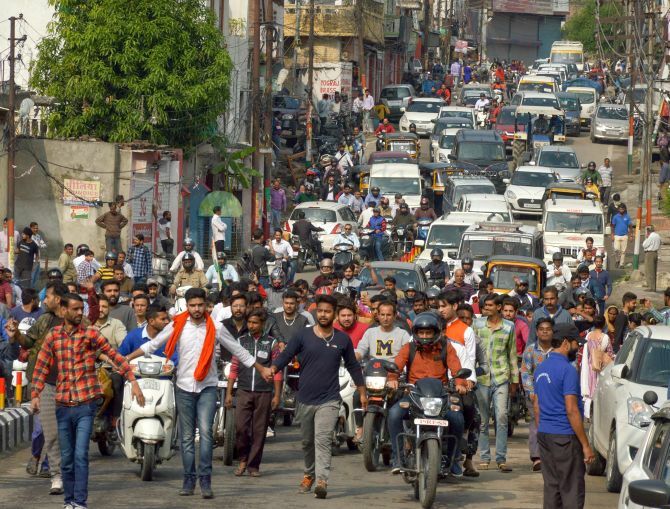 He said the curfew, which was imposed in the town on Thursday night, was strictly in place and additional security personnel were deployed in the sensitive areas of the town. Rana said there were no reports of any untoward incidents following the killings of Parihar and his brother by suspected militants. Kishtwar district had witnessed communal clashes in the past. Terrorists had attempted to create communal tension in the region by targeting Hindu community, especially in higher reaches. In 2001, the terrorists killed 17 Hindu nomads. Anil Parihar was active in politics for over 25 years and had unsuccessfully contested the 2008 assembly polls on a Jammu and Kashmir National Panther Party ticket. Ajeet Parihar was an employee of the State Forest Corporation. On Thursday, the two were walking towards their home in Parihar mohalla through a dark lane in Tapal Mohalla when they were fired upon from a close range by suspected militants around 8.40 pm, officials said. The assailants were apparently waiting for the brothers to return home, they said.